IBM Support newsletter sent out information about end of support on Java 6 on Connections 5.5. This does not mean it will stop working, hehe, but there will be limited fixes for Java 6 runtime version. End of April 2018 is the cut off time, but there will be extended support from Oracle until December 2018. So, the recommendation is to upgrade to Connections 6, basically, where java8 is supported. iOS 11 introduced ".HEIC" image format which you might have problems viewing. Here´s an IBM Connections iOS app workaround. When you share a photo from your iOS device into the IBM Connections app, it will upload as a .heic picture. What other users then can´t do, is actually see this picture. Downloading it to a Mac is OK, but Windows does not support it, and watching .heic in a browser is also not working. If “Most Compatible” is not checked, select i. This will turn your iOS device into a jpg picture taking machine again. If you also use BOX, then this is the way to go for the BOX app as well. If you do need to watch a photo in .heic format, there are some converters out there. Third party HEIC to JPG converter tool, like Joyoshare free HEIC converter, imazing HEIC converter, iMyfone and so on. After saved as JPG format, you can view your photos from iOS 11 to any other devices easily. I finally figured it out!!!! OMG, so very happy. My customers will be happy as well, and that´s the whole point of doing this, right? 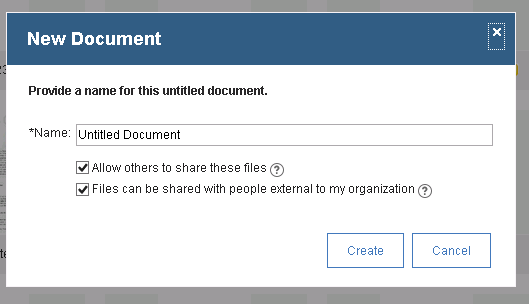 Well, previously I have posted a blog entry about the fact that when uploading files into IBM Connections, the users has to manually tick off the checkbox "Files can be shared with people external to my organization". In that previous blog post, I presented a solution where you had to run a change in the Files SQL database. Linux is so much easier when it comes to searching through file content, so I went over to a Linux installation and performed the searches there (even though my test server where I can do the changes is on Windows). So, in Linux, I searched every file possible for this, by running the command in the "AppSrv01\InstalledApps\cellname\Files.ear" folder. I then went into the Common.ear folder, and search through every .jar file. I then went into the data/shared/provision/webresources folder and search through every .jar file. And there we go! I found a couple of .jar files where the string "_setExt" was found. Inside the jar file, it´s under the folders "resources\action" and it´s name is "AbstractShareFile.js". 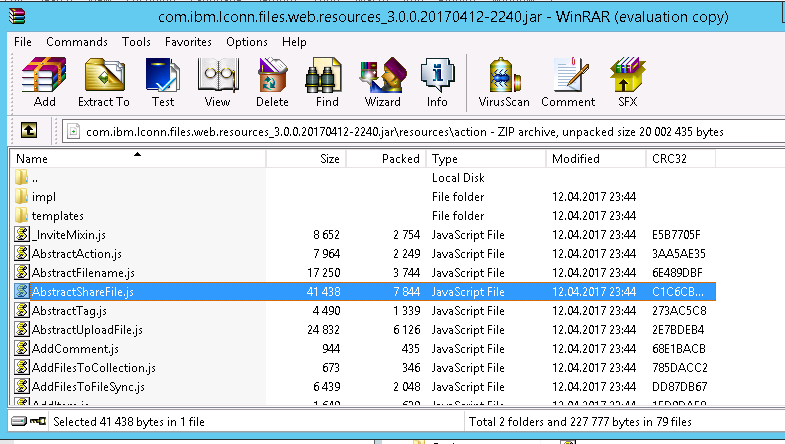 So, after taking a backup of the "com.ibm.lconn.files.web.resources_3.0.0.20170412-2240.jar" I tested by unzipping the jar file, changed the file "AbstractShareFile.js", and zipped it down again. A restart of the Connections servers was needed, and afterwards, I could actually see that my beautiful checkbox actually was ticked off!! 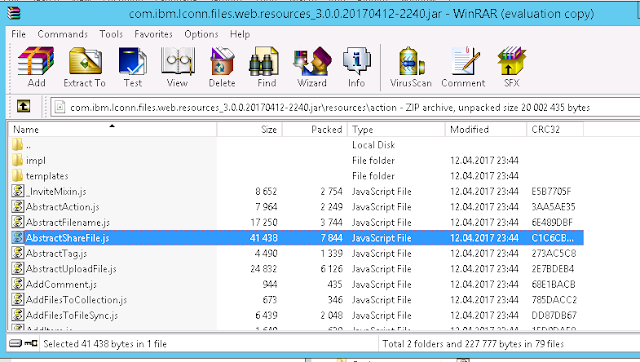 First of all, I put the original file "com.ibm.lconn.files.web.resources_3.0.0.20170412-2240.jar" back. "lconn\files\action" and I had to save my modified "AbstractShareFile.js" file there. I then restarted the Common Application in the Websphere Console, and also deleted my browser cache and tried a new file upload. 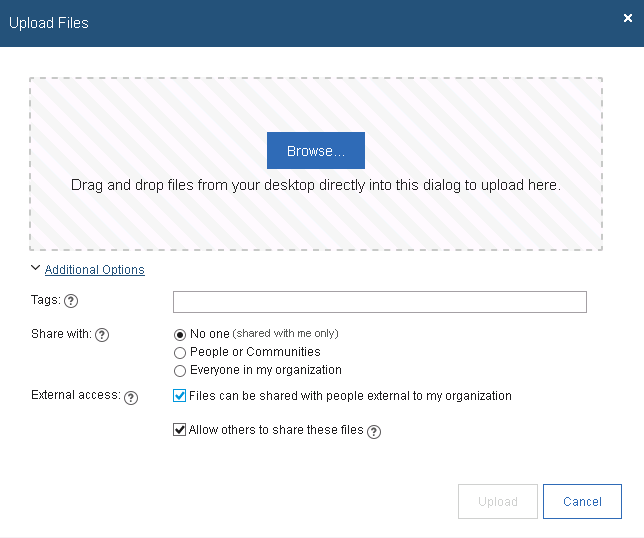 Pressing "OK" gave me the normal file-upload dialogue box, with the checkbox in question actually ticked off!! I tested doing a file upload by dragging and dropping a file into the browser. This worked fine as well. And also, using the big blue "Share" button in the header also worked. But hey, hang on. What about when you create documents directly in Connections using the IBM Docs feature? This shows a different dialogue box than the normal "File Upload" one. Oh, I managed to figure this one out as well!! See under the folder "resources" in the jar file and copy out "global.js"
The "concord" folder probably has to be created by you. Open up global.js and go to line 250 and comment that one out. 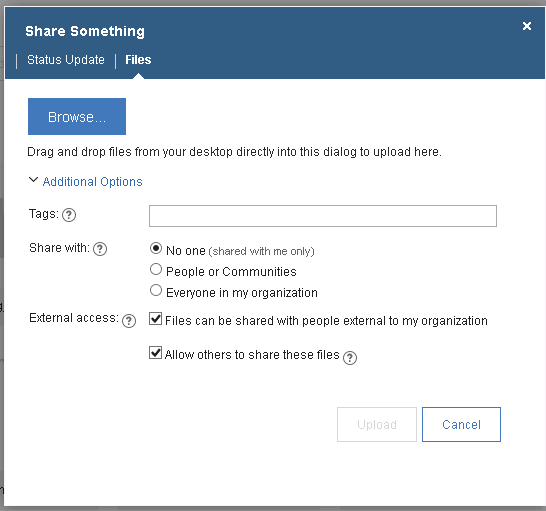 What you then see, is that the box "Files can be shared with people external to your organization" is ticked off for you! The downside now is that you have to copy the global.js out from the correct jar file every time the IBM Docs gets updated with a new CR fix pack. And the same goes for the "AbstracShareFile.js" when you do a CR update of IBM Connections. 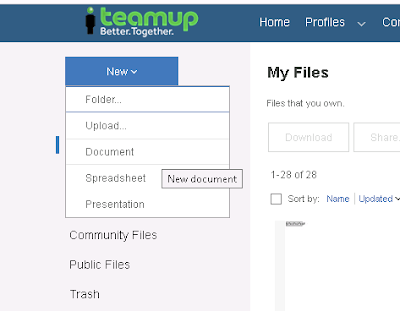 Remember, this is for Connections 5.5 CR3 with Docs 2.0 CR 3. I have not tested this on Connections 6 yet. The line numbers I refeer to might be different for other versions than the system I did this on if you are on other versions of Connections and Docs. I will post a blog entry when I try this out on Connections 6.x as well.